Love this! 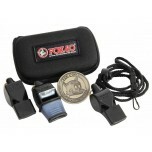 Whistles are top of the line, also love the case they all come in, another wonderful product from a great company. Great kit! The carrier is nice and hard.